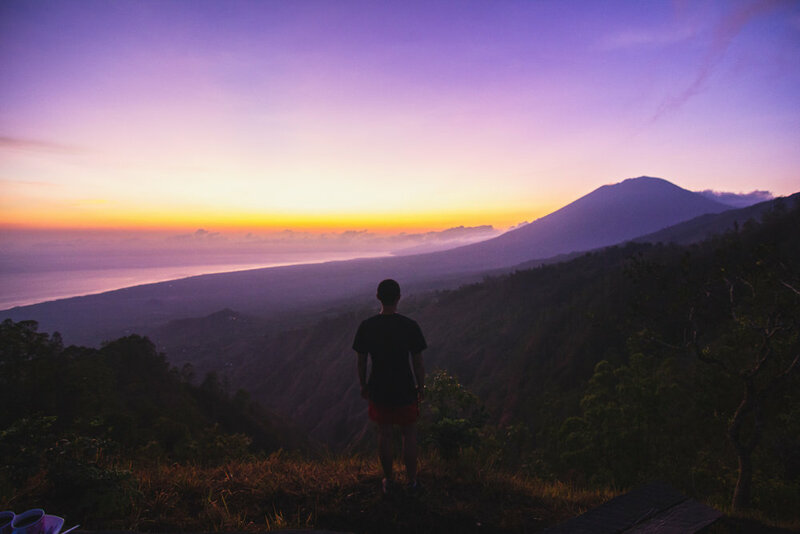 Hands down the best sunrise we saw in Bali was from the East Batur Caldera in the north part of the island. The hike up Mt. 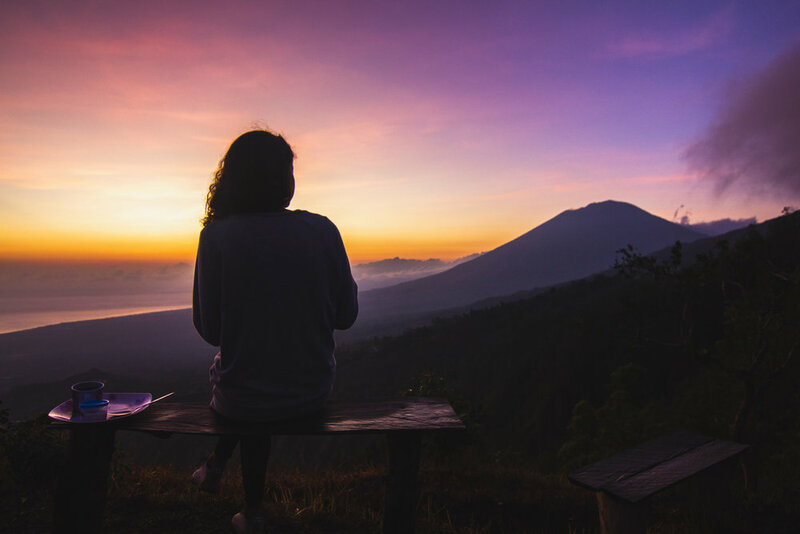 Batur itself is advertised everywhere and you’ll find it on most “Best of Bali” lists online, but is infamously crowded and is often completely surrounded by clouds. The owner of our homestay recommended instead that we do the caldera trek instead, which is not as high but is usually entirely empty and has clear views. We’re so happy we took his advice because the hike was a truly unforgettable experience! We stayed in Songan Village in Kintamani, near the lake on the north side of Mt. Batur. Depending on the trek you sign up for, there will probably be complimentary pickup provided from most places on Bali, but we did the trek as part of a weekend trip to East Bali. We were happy to stay the night because the pickups often leave around 1 or 2 AM! Kintamani is a 3 hour drive from Canggu or 2 hours from Ubud. It’s a long but fairly easy scooter ride. If you’re coming from the north or east, be aware that the ride is quite hilly and can get cold! Hiring a private driver is also an option and will run you 300-600k depending on where you’re staying beforehand. The listing of the homestay we booked specifically indicated that they could organize Mt. Batur trekking, and before we arrived the hosts provided us with the different hiking options. I’d imagine that most places in the area can organize similar trips. Ours cost us 1.1M IDR for 2 people, about $35 USD per person. This is on the expensive side compared to most activities in Bali and especially given the short duration of the trek but seems to be fairly standard for the guided treks in the Batur area. Our host, King, runs Indo Bali Hiking and we were very happy with our experience! We started the morning at 4 AM with some fresh fruit and coffee, and walked down the street to the company office to meet the guide and pick up headlamps and walking sticks. Because the trek we did was on the north side of the lake, we had to take a small boat across the lake to reach the trailhead. At around 4:45, we started the short trek up the hill. The hike itself was only around 45 minutes. The first 20 minutes were up a dusty path to the crest of the hill, and the second half was along the flat ridge to the viewpoint. We arrived at the top at 5:30 barely out of breath and were pleasantly surprised to see that we were the only people there! Our guide Putu broke out the breakfast of hardboiled eggs, bananas, bread, snakefruit (which we had never tried before but was delicious!) and hot coffee, and we ate while waiting for the sunrise. At 6:10am, we saw the first edge of the sun peeking out over the horizon, and Putu pointed out the 4 mountains we could see - Mt. Batur behind us, Mt. Agung and Abang to the southeast, and Mt. Rinjani on Lombok silhouetted by the rising sun. As we watched, the sky changed color from purple to red to blue and the morning fog floated over the rim of the caldera and evaporated. After taking copious photos, we started back down the mountain at 6:35am. On the boat ride back, we stopped at a large gold statue of Dewi Danu (a water goddess) on the lake. Then we headed back to the company office where King treated us to a bowl of Balinese porridge. Kintamani Homestay - where we stayed! Feel free to shoot us an email for their contact info. Bali Jungle Huts - highly rated, between Ubud and Mt. Batur. Be sure to check out our Ubud guide for more things to do in the area! Lempuyang Temple in Bali - Worth the Hype?